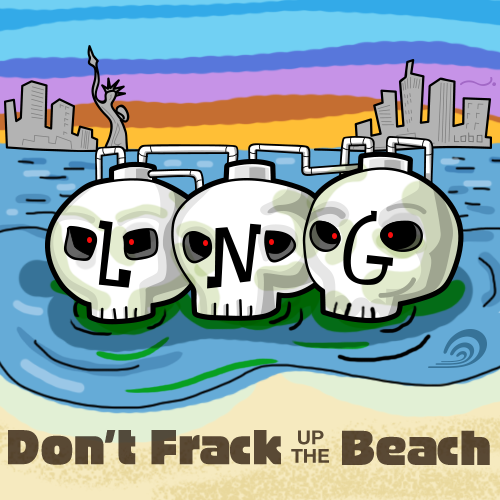 It’s time once again to rally for one final stand against the unnecessary, unwanted, and pointless proposed liquid natural gas facility off the coast of New Jersey. We made our presence felt the last time around and we need a big turnout on November 4th and 5th at the Sheraton Hotel in Eatontown, NJ. Each meeting will take place from 6:00 pm to 10:00 pm with an open house from 4:30pm to 5:30 pm. We encourage all Jersey Shore residents who want to see this matter settled to come out and speak their mind and show their opposition. The Port Ambrose facility would be a severe environmental risk and offers little to no benefits for the state of New Jersey, New York, or their residents. We have to get Gov. Christie to veto this project and prevent something that will be detrimental to the Jersey Shore that we know and love. Please join the Jersey Shore Surfrider chapter at this final public hearing on Wednesday, November 4th or Thursday, November 5th at 6 PM at the Sheraton Hotel in Eatontown, NJ.